The venue for UKNOF 29 and ISOC’s ION Belfast meeting to be held in September this year is currently looking like another great place for UKNOF to meet – it’s the Assembly Buildings, right in the middle of the city, easy to get to, and a good choice of hotels (from budget options such as Travelodge through to mid-range Jury’s Inn, and the higher end Europa and boutique Fitzwilliam) all less than 2 minutes’ walk away. There’s also some smashing restaurants and bars for the all important networking we come to do at UKNOF. Don’t be put off by the theatre seating above – this was for the event occurring the next day – we’re looking at either cabaret or classroom seating for our event, there will be somewhere to put your laptops! We decided on this venue not just because of it’s central location, but the high specification of the AV and technical support provided in house. 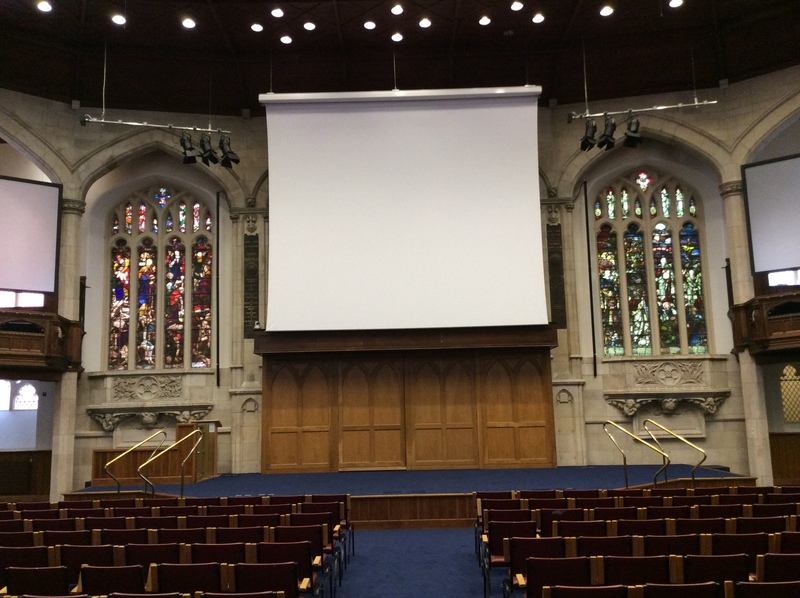 The home of the General Assembly of the Presbyterian Church in Ireland, the 109 year old building recently benefitted from a massive refurbishment, including a serious tech upgrade. It has a Gig of bandwidth to the building. The UKNOF connectivity will use this as the transport to bring in our own Internet Access (over a tunnel) with no NAT and native IPv6, provided as usual by Tom at Portfast. I recently visited to check this all works as anticipated, and it seems to work just fine. The tunnel to Portfast’s Docklands router came up just fine, and 80-90Mb (this being constrained by the router in use as the tunnel endpoint) was achieved with no issues. The resident IT guys are super-helpful, and have even offered the use of their existing Aruba wifi platform for distributing the UKNOF wifi network in the building. If this works, it will mean that UKNOF doesn’t have to ship a load of access points out to the venue. Our testing revealed some limitations in the current Aruba setup, such as IPv6 RAs and ND apparently being blocked in the current config. Fixing this is on the list of things to do, as they don’t natively run v6 yet as part of their day to day operation so haven’t been concerned about it (until now). We also need to investigate operating separate 2.4Ghz and 5Ghz wifi SSIDs, they are currently set up single SSID with bandsteering, so we may want to set up with specific radio heads as 5Ghz only. This is all stuff to work on and resolve with their tech folks in the next few weeks. Even if we decide we’d rather run our own access points because of the high client density at our meetings, this should be relatively simple and not require transporting lots of kit. The main hall can be covered by 4-6 access points, and there is plenty of structured cabling. Audio isn’t a problem. A rather nice Allen & Heath desk is permanently installed, and the standard rig includes plenty of radio handheld and lapel mics, and sidetone/foldback is provided for the presenter. On the day desk will be looked after by a professional sound engineer. The venue even has it’s own permanently installed video system, comprising four HD pan-tilt-zoom cameras with video switching, that can provide an SDI out. Hopefully the folk over at Bogons who support UKNOF with webcasting can ingest this, and avoid having to bring their own camera. If the big stage and stained glass window backdrop hasn’t scared you off yet, the Call for Presentations is open, and our regular Programme Committee has been strengthened by the addition of David Farrell from Tibus and Brian Nisbet of HEAnet for this meeting to help us find interesting local content. The RIPE NCC will be holding their Basic and Advanced hands-on IPv6 training courses in the same venue (just a slightly smaller room!) on the Wednesday, Thursday and Friday of the same week. We’re really looking forward to September, and welcoming Internet Operations folk from the whole of Ireland (both The North and The Republic), the UK mainland, and elsewhere to Belfast. Next Next post: What’s next for Open-IX?